After four days without announcing a new case, Saudi Arabia is back with a new primary case - listed in critical condition - from Hafr Albatin. The patient is a 57 y.o. male with no known exposure listed. 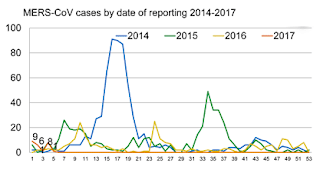 During the month of January KSA reported a total of 24 MERS cases, which is a bit higher than we've seen in the past 3 years (see chart below).